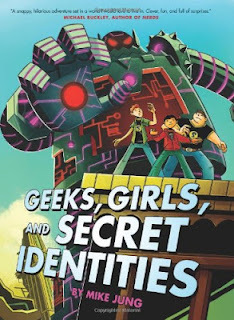 Reader Gut Reaction: I've been meaning to read Geeks, Girls and Secret Identities for quite a while, because the author, Mike Jung, is an online buddy and avid blogger, and he's also local to the Northern California area and this is his debut. After going to his, er, stupendous book launch and buying a copy, I had it sitting in my TBR pile, but then I had to put it off just a bit longer because Cybils time was looming, and Mike's book was on the finalist list for MG sci-fi and fantasy (yay!). Anyway, this book is definitely deserving of its spot on that finalist list. It's got a blend of humor, silliness, geeky fun, and action that will appeal to middle grade boys for sure, and girls, too. Anyone familiar with the superhero genre will enjoy the humorous take on classic tropes. Also, it was a lot of fun to see Mike's very characteristic writing/blogging style translated into a book for young readers. If you've seen his blog (specifically, his blog URL), then you won't be surprised that the hero of this book is Captain Stupendous. Well, he's the SUPERhero of the book. The actual heroes are Vincent Wu and his friends, who have to save Copperplate City when something goes a little awry with their patron-in-spandex. Concerning Character: Vincent Wu not exactly a popular kid. In fact, he's kind of little and nerdy. (And he's biracial—another yay!) But he's got his two friends George and Max, and together, they comprise the Unofficial Captain Stupendous Fan Club—not to be confused with the OFFICIAL Captain Stupendous Fan Club, who are a bunch of jerks, or the Stupendites, who are a bunch of girls. Vincent and his friends are the most devoted of the fans, though, and they know every last detail about their idol and protector. It seems like the only person at their school who doesn't really care about the whole superhero thing is the girl Vincent has a crush on, Polly. The characters are all funny, appealing, and wisecracking but also realistically goofy and weird and awkward—recognizable and believable kids, even in a somewhat fantastical setting where there are superheroes (and, of course, supervillains). Vincent is an engaging protagonist who helps demonstrate that being a hero isn't just about brawn—brains are pretty important, too, not to mention loyalty and bravery. Mike Maihack's lively illustrated renditions of the characters bring them to life in a bold black-and-white style. Recommended for Fans Of...: Sci-fi or fantasy humor, and books that have a somewhat tongue-in-cheek approach to the genre, like Jasper Fforde's The Last Dragonslayer (reviewed here), Redshirts by John Scalzi (reviewed here), or even City of Spies by Susan Kim (reviewed here), which isn't exactly in the same vein but has a superhero theme. 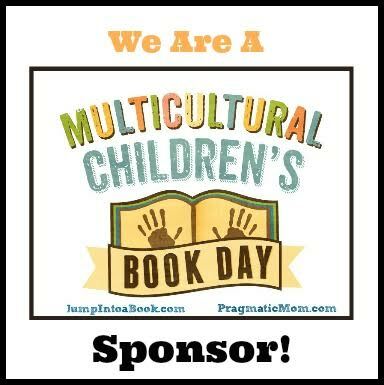 Themes & Things: As I touched on above, there's a lot in this book about what it really means to be a hero, and the author explores this idea from a number of angles. I don't want to give away any spoilers, because there are some really fun twists and turns, but generally speaking, this story shows that there are a lot of different ways to be a hero and a worthy human being. It's not all about having magical super-moves or being big and brawny. And you certainly don't have to have any of those things to be a winner and a hero in your own life, to the people who really matter. Review Copy Source: Purchased my own copy. You can find Geeks, Girls and Secret Identities by Mike Jung online, or at an independent bookstore near you! I just added this to my list. Sounds like great fun! Oh, what a lot to love, and even a fun cover!